If you’ve always wondered what can change the nature of a man but never wanted to play the clunky old version of Planescape: Torment (or bother with mods), here’s a new option: Planescape Torment: Enhanced Edition, announced today by the folks at Beamdog (best known for Baldur’s Gate: Enhanced Edition). I’ve played a couple hours of this enhanced version of Planescape Torment, which comes out April 11 for PC, Mac, Linux, iOS, and Android. Unlike Beamdog’s previous ports, there’s no new content this time around. 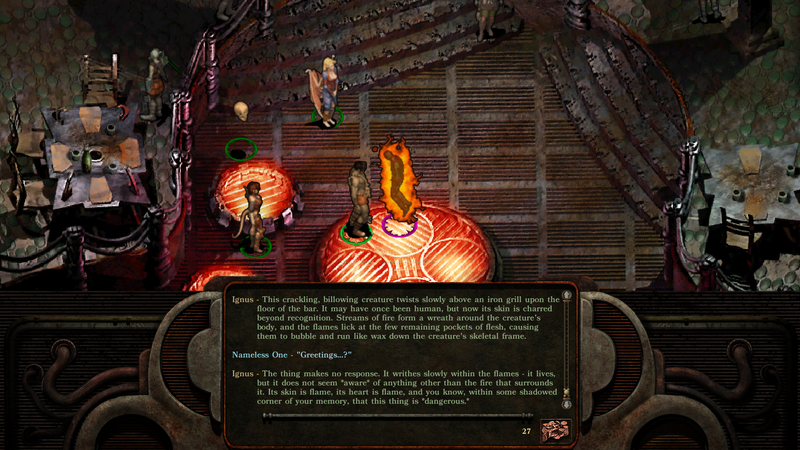 This version doesn’t alter Planescape’s original text at all—other than a few edits supervised by the original game’s lead designer, Chris Avellone—but it does make the game far more playable thanks to new high-def graphics, some interface improvements, and a bunch of neat usability tweaks (like highlighting objects with tab). It looks great, too. If you’re interested in playing (or replaying) one of the best games ever made, an RPG that explores questions about reality and humanity and mental prostitutes, this version of Planescape may be right up your (pregnant) alley.